That was the statement issued by Al Qaeda today who have just acknowledged the death of their leader Osama Bin Laden. The Associated Press unveils more info about possible attacks the terrorist organization may have against the US and Americans.The confirmation came as newly uncovered documents found in bin Laden’s residence revealed al-Qaida plans for derailing an American train on the upcoming 10th anniversary of the Sept. 11 attacks. 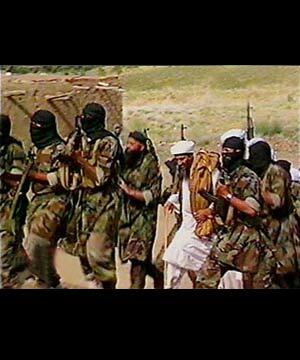 Terror experts have said bin Laden’s death on Monday was a setback for al-Qaida but the threat of attacks remains and could even spike in coming days from individuals or small extremist groups inspired to take revenge for the killing.The statement, dated Tuesday but posted Friday on militant websites, opens the way for the group to name a successor to bin Laden. His deputy Ayman al-Zawahri is now the most prominent figure in the group and a likely contender to take his place. In the words of Shawn, we don’t believe you, you need more people. I could go on and on about Bin Laden, the story about how they tracked him down via his courier who spoke about Bin Laden with his friend while they were on the phone, the so called sea burial etc. etc., but I'm kind of done with the whole C.I.A. vs. Al-Qaeda subject. I've had too much of it since the fake news broke out on the first of the month. But let me tell you this; if we really did get Bin Laden, he would've have been hanging from the highest tree for everybody to see, dead or alive. But we did not catch him and that is why there are zero pictures released and all supposedly because they do not want to shock the world and be responsible for any attacks coming from vicious terrorists. After all, killing Bin Laden and releasing proof will do that, but killing thousands of babies and women in Iraq and Afghanistan does not make them angry at all, it only tickles them. As told by Abu Muar Zarq, Bin Laden was and is always wearing a bomb vest. Any sign of the enemy being close and he would’ve made himself a martyr according to his own views. And let me also tell you this, Bin Laden is a Wahabi meaning that he practises Wahhabism, he would never live in a villa let alone be caught dead in it. Too bad the ‘’super elite military unit’’ didn’t get any schooling on cultural relativism to figure this one out. And most of all, on 02-11-2007 Benazir Bhutto, first female prime minister of Pakistan, told David Frost in a interview that Bin Laden was already murdered by the Pakistani militant Ahmed Omar Saeed. On 27-12-2007, she was assassinated.